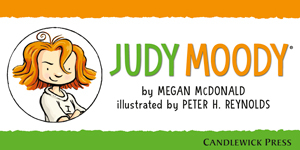 We’re delighted to partner with Candlewick Press to introduce the latest title in the beloved Judy Moody book series. 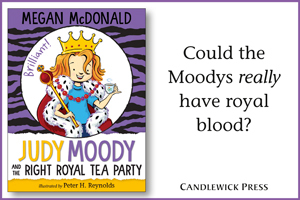 In Judy Moody and the Right Royal Tea Party, Judy discovers that she might have royal blood! Some old-timey Moodys lived in merry olde England and might have been related to the Queen herself. Throughout the story, Judy’s family tree gets a few more shakes — and even more surprises come tumbling out. Your family will love taking this adventure with Judy as she finds out some royal family secrets. Want to celebrate your own family history to connect with relatives — and friends who have become family? Check out the ideas below. What’s in a Name? - Trace the origin and meaning of your last name — you can use the Internet, library records, censuses and online databases. Share your discoveries and work together to create a family crest or collage inspired by your heritage. Royal Poet - Judy Moody pretends to be a Royal Poet in her adventure. Follow her lead and hold a contest to see who can write the funniest poem, limerick or ode to your family. Invite family members to recite their verses at your next get-together and give out prizes to the most creative poets. Birthday Tradition Extravaganza - Pull together some of the special ways your extended family (or group of friends) celebrates birthdays — from special cakes to decorations to outings — and have one big bash in honor of sharing another year together. Add a royal twist with crowns for your guests! Family Potluck - Invite your relatives and friends to make their favorite family recipe and bring the dish to a potluck dinner. People can go around the table and share memories of the dish and the family members who have prepared it over the years. Golden Crowns for All - Give each member of your family or group of friends a royally accurate title, highlighting a skill or trait (Royal Chef, Royal Dog Walker, Royal Joke Teller). High Tea - You don’t need royal relatives to host a tea party fit for a queen! Invite family (or friends/neighbors) to attend and give each guest a name tag with an official royal title. Serve fancy yet inexpensive refreshments like finger sandwiches, cookies, tea and lemonade for kids. Photo Circle - Make a wreath out of special photographs of family and friends — search online for examples and instructions. Bonus points for hanging it on your front door! Family History Trivia Night - Ask parents, grandparents and other relatives to share several facts others may not know about your family history. Examples include facts about ancestors and their countries of origin, grandparents’ wedding details and funny childhood stories. Invite family members over for a trivia night or play the game at your next family get-together. Royal Movie Night - Choose a classic movie featuring royals and invite your family or friends over for a screening with popcorn and treats. Royal movie ideas include: Cinderella, The Princess Diaries, King Ralph, The Queen and The King’s Speech. Create a Family Tree - See how many generations of your family you can trace by creating a family tree. Use a free online template or draw one on a poster board. Pen Pal Relative - Writing letters can help kids connect with a relative that lives far away and learn more about how family members communicated in a different generation. Grown-ups can make the introduction and help with letter writing if needed! Family Reunion - Though it’s fun to see family photos on social media, there’s nothing like spending time together in person. If it’s been a while since your last family reunion, invite relatives to a barbeque or holiday celebration. Virtual Book Club - Even if you don’t have many relatives close by, starting a virtual family or friends book club is a great way to stay in touch and share classic titles with the next generation. Take turns selecting a book that everyone can read and discuss on video chat. Honor Your Roots - Explore the history, culture and cuisine of your ancestors’ countries of origin. Start a new monthly or yearly tradition celebrating your roots by cooking a new dish, playing traditional music or learning a few words of your ancestors’ native language. Family Slideshow - Invite relatives to share photos a few times a year and create an online album or video featuring a compilation of snapshots. You can also include the latest news from family members in the photo captions or in an email. Royal or not, every family has its own special stories to share across generations. Try a few of these ideas to inspire new traditions and bring your family closer together.